Robert “Bob” McCollar serves as the international business development manager for Loudoun Economic Development. He works to promote the department’s services throughout the international business community, and acts as a resource for the county and Commonwealth of Virginia to attract, grow and maintain international business in Loudoun. 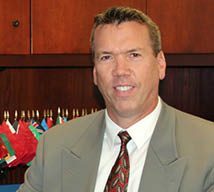 A Loudoun resident for almost 20 years, McCollar is a licensed attorney with 25 years of executive business development and legal experience, working with international businesses in a diverse range of markets. He has a bachelor’s degree from Trinity University and a doctorate of jurisprudence from William Mitchell Law School.